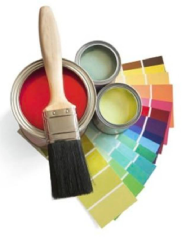 KL Decorators is a well established local painting & decorating Company based in Orpington, Kent. We operate across North Kent, South East London and surrounding areas. We are dedicated to giving you the best possible customer service and satisfaction. experience in all aspects of property decoration. We specialise in domestic properties but our services do cover a proportion of commercial, insurance work and New Builds. We pride ourselves on a high standard of work as well as attention to detail and a friendly service. We offer very competitive prices. We know we provide an excellent service as 75% of our business comes from our existing clients and referrals. Our initial consultation is free and you will be given, in addition to an estimate, any advice you may require on selecting adequate paints and materials to care for your surfaces, to achieve the desired results. We are happy to help you to choose a colour scheme and can provide you with an extensive colour chart to help with the process. We are only too aware that in some cases the rooms to be decorated cannot be fully cleared prior to us starting any works. We will be more than happy to move any large and heavy furniture on the day of arrival and/or to cover any other furniture/kitchen units in order to protect them. Application of paints by hand – rolled or brushed, where required.